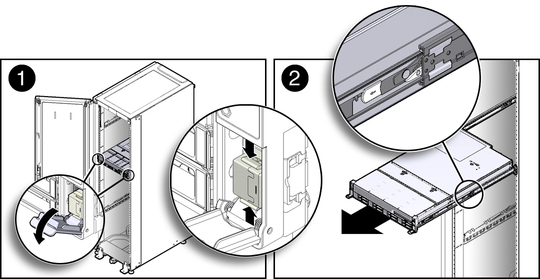 If the server is installed in a rack with extendable slide-rails, use this procedure to extend the server to the maintenance position. From the front of the server, open and hold the left and right release latch covers in the open position. When in an open position, the release latch covers squeeze the slide-rail release latches . Caution - Deploy any rack anti-tilt mechanism before releasing the slide release latches. While the release latch covers are in the open position, slowly pull the server forward until the slide-rails latch into a locked position . The server is now in the extended maintenance position.